Coconut rice pudding with citrus and sesame. Photo: Supplied. Since its inception, Monster Kitchen and Bar along with the Nishi building in which it is housed have always been a little different, pushing boundaries of Canberra hotel and restaurant norms and in the process helping to reshape the city. Elegantly combining doses of art with inner-city chic and urban edge, the interior architecture is striking the moment you walk through the doors. Starting with the dramatic eco staircase and continuing with the quirky, moody styling of the different dining spaces. Filled with industrial artworks in all its nooks and crannies, the whole place is an avant-garde masterpiece without feeling stuffy, as it is all open to touch and explore. Meandering through the building and the Hotel Hotel lobby, and cosying up with a drink and a snack from Monster Kitchen and Bar has always been a delight. Recently though, there has been a change in ownership and name, so now, Hotel Hotel is Ovolo Nishi. 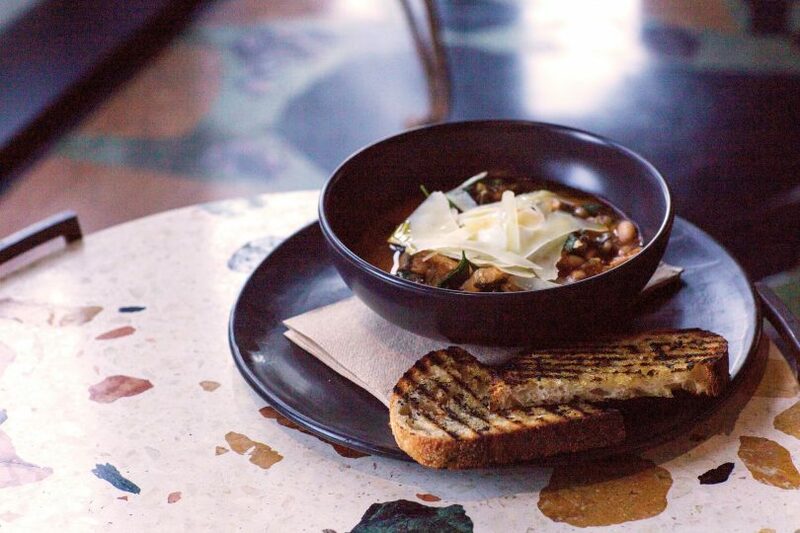 We paid a visit and chatted to Ovolo Nishi General Manager, Nicole Short about the changes and how that has impacted its restaurant Monster Kitchen and Bar. Since opening Monster has had a menu that changes with the seasons. So the only change to the restaurant with the new ownership is that of a change in menu to celebrate the best of winter produce. Ribbolita with slow cooked egg with Reggiano and charred sourdough. Photo: Supplied. Open from 6:30 am till late every day there are winter warmers for all, from the early morning risers through to those grabbing a late night tipple! 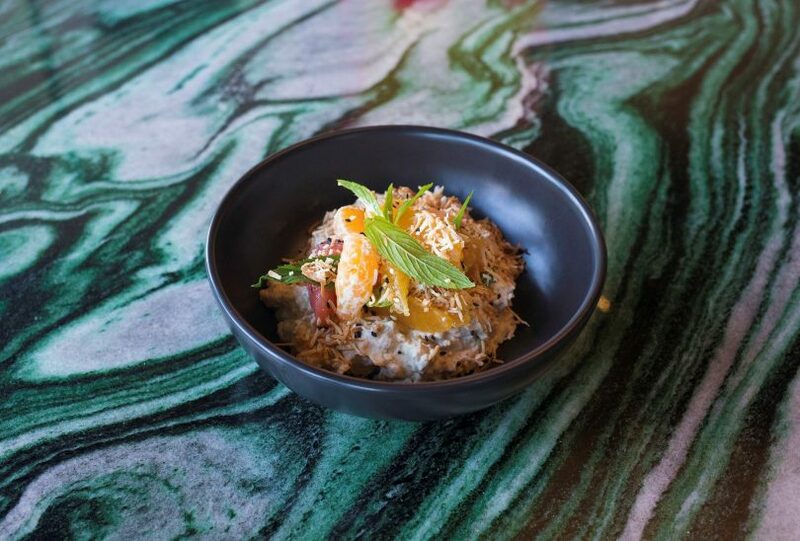 Highlights include breakfast items set to wake up the taste buds with dishes such as the Ribbolita with slow cooked egg with Reggiano and charred sourdough, or Coconut rice pudding with citrus and sesame. Lunch and dinner time brings a choice of two options, there is the mix-and-match shared-plate menu, or you can also order from the bar menu. Standouts include Flinders Island wallaby with smoked beetroot and macadamia, and the Spiced lamb ribs with curry leaves, chilli and lime. For our dinner visit, we stick to the shared plates menu and are guided by the knowledgeable staff to narrow down the choices. The first dish to hit the table is Cauliflower, farro, taleggio custard, hazelnuts and truffle described to us as a sophisticated version of your grandmothers’ cauliflower cheese bake. The dish is earthy and we have our first taste of local truffles for the season and are immediately reminded of all that is good about winter produce. 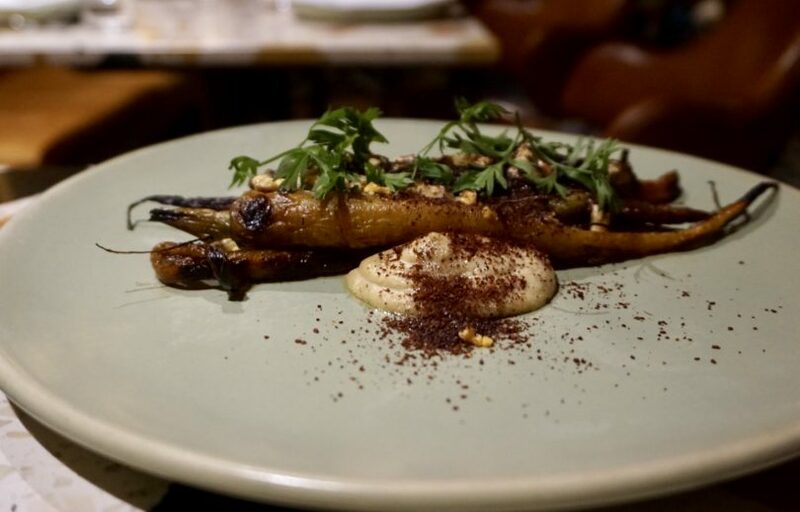 The crunch of the hazelnuts paired with the charred cauliflower is extremely satisfying and has us going back for more and more. Spring Bay mussels with fennel, nduja and prosecco. Photo: Sophia Brady. Roasted carrots, almond, cumin, shankleesh. Photo: Sophia Brady. Next to arrive is our favourite dish of the evening and perhaps it is, in fact, the best dish I have eaten in Canberra for a very long time. The Spring Bay mussels with fennel, nduja and prosecco brings winter comfort through the spicy broth permeated with the taste of the creamy, hearty nduja salumi. 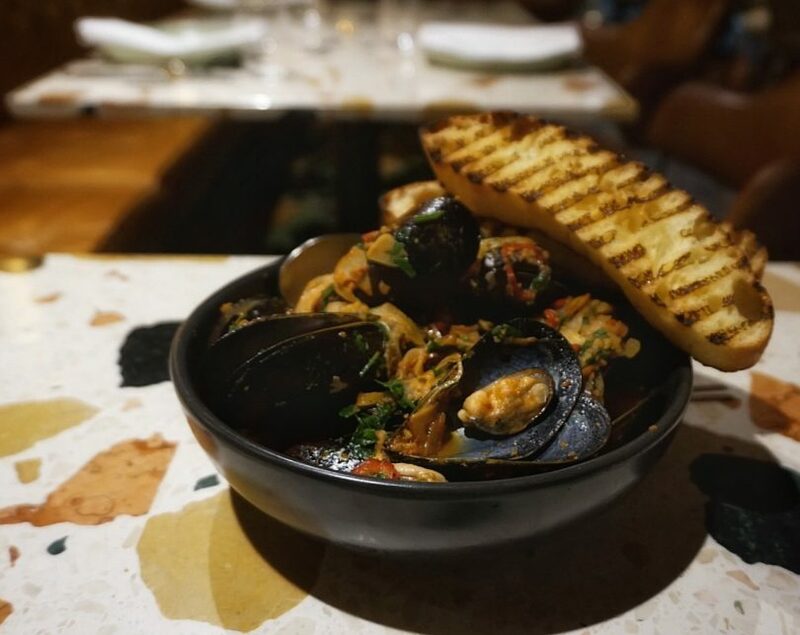 When you get a bite of all the elements together, including the mussels with fennel dripping in the cooking liquid, it is a touch of paradise. We also try the Roasted carrots, almond, cumin, shankleesh and the Grilled wagyu intercostals, soubise, celery, bone marrow dish. 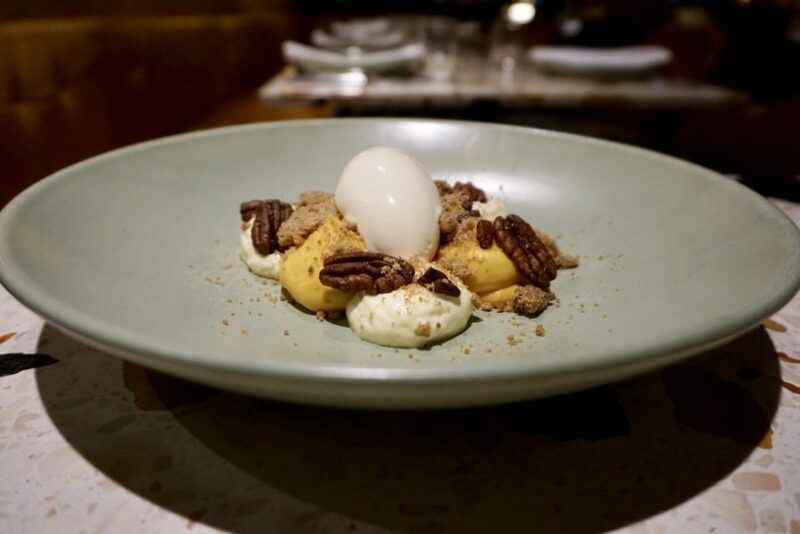 To finish, we try the restaurants take on the popular American pumpkin pie dish featuring Roasted pumpkin puree, cardamom, smoked maple ice cream, candied pecan, chai. We are left feeling extremely satisfied and are further reminded why Monster Kitchen and Bar has been given one Good Food Guide Chef Hat in 2018. Roasted pumpkin puree, cardamom, smoked maple ice cream, candied pecan, chai. Photo: Sophia Brady. Monster Kitchen and Bar is located in Ovolo Nishi at 25 Edinburgh Ave, New Acton. *Sophia enjoyed her meal as a guest of Ovolo Nishi.